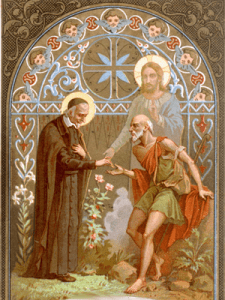 Vincent de Paul’s activity on behalf of liberation had two aspects:  evangelization or the proclamation of the Good News and  concrete action in order to make the proclamation credible. Engaging in this process in any other way simply makes a mockery of the Good News because then we would be proclaiming the joyful news of a liberation which we ourselves did not believe, a liberation which we did not want because we preferred the gilded enslavement to money and power. This is the accusation that has often been leveled against the Church when she has proclaimed the Gospel with words but failed to accompany those words with effective action… when she has proclaimed the demands of freedom but continued to act in an authoritative manner… when as teacher of the truth she has instructed the world but made no effort to become “servant and poor”, made no effort to draw closer to people.